Creating a "Food Planning Binder" has been essential in getting my thoughts and such together about planning our meals, trips to the grocery store, etc. I originally put the binder together as a regular planner/organizer, but it has since morphed into "My-Entire-Life Planning Binder". 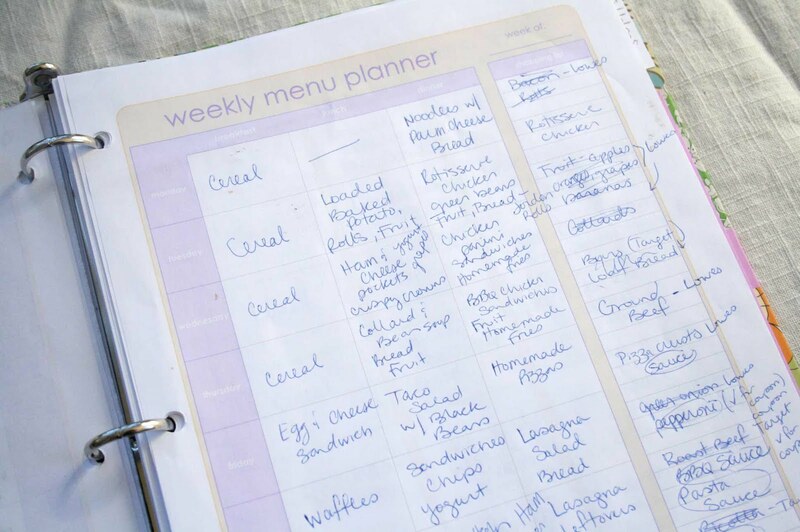 So now, mine contains several different categories such as: a month calendar, a week by week at-a-glance calendar, notes pages, to-do lists, shop/blog planning pages, and now month long meal planning, week-at-a-glance meal planning, to-try recipes and shopping lists. For today, a few ideas on creating a Food Planning Binder. 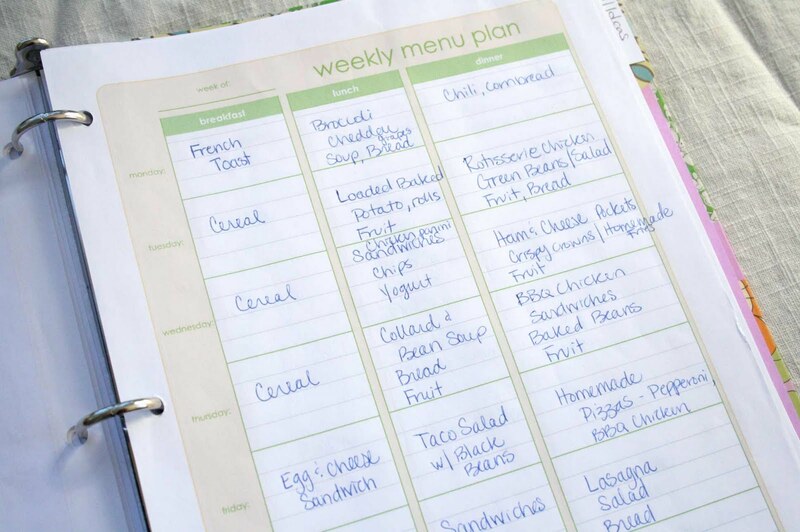 Feel free to make it more than just a Food Planning Binder as I have, however this post will focus mainly on what has worked for me related to food planning. 1. Month Long Calendar - I have this to keep track of my monthly appointments and events (along with some of my hubby's appointments) - but to also plan out when I am going to go to the grocery store or if a certain sale is happening somewhere on a particular day/week. It is also helpful to know if one of us is going to be out of town or out on business during mealtimes, to know how to plan accordingly (I won't need to fix as much food if my hubby is on business, etc). 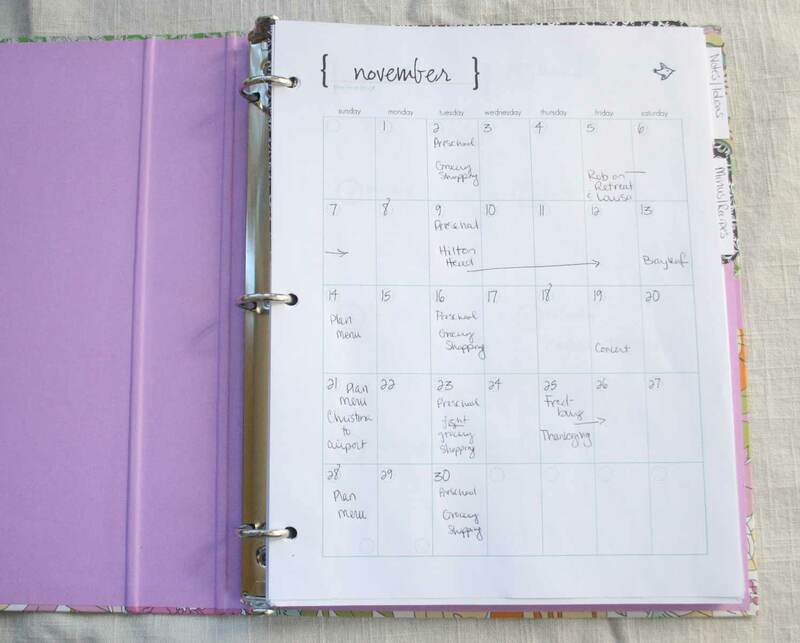 * It is super simple to make your own calendar each month on a word processing program, online, or to find one on a blog that has them available for free download. *I purchased a downloadable perpetual calendar for pretty inexpensively here. 2. Price Book - Creating a price book is a time-consuming process, but well worth it in the end. I printed off some price book sheets here for free. I then made a list of some essential ingredients (flour, butter, sugar, etc.) that I am always needing to have on hand (this list has since become longer, after making the Pantry Staples list). Over the course of several weeks, I went to 4 of our local grocery stores (Target, Harris Teeter, Kroger, and Lowes Foods) and wrote down each item's price (and ounces, if appropriate). This is super handy to know which items are the best price where, and to know if you see an item on sale in the ad circulars one week, if it is cheaper to buy it at that store on sale (we'll talk more about ad circulars and other quick tips for sale items soon - it is just a good idea for now to get your price book going since it can take awhile to compile). For example, say that Gold Medal bread flour is $2.59 at Harris Teeter during a normal week - this is the cheapest place I can get it if I need it at any given time and am not able to wait for it to be on sale. But, say one week the ad circular comes out for Lowe's Foods, and they have it on sale for Buy 1, Get 1, so it is $1.50! I would then incorporate that into my weekly food budget. Yay! So you see? It's good to know what is what price and where :) 3. Weekly Menu Planner - I also dowloaded these for free here and love them. 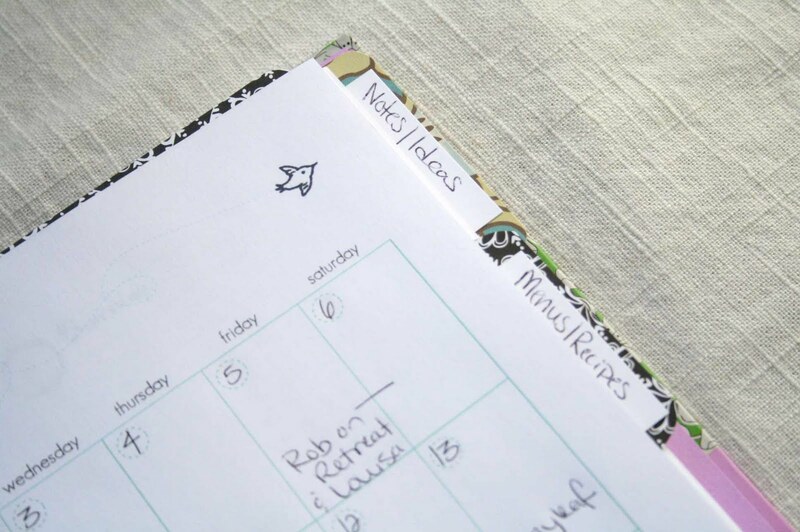 It's super helpful to plan out the week's meals and write down the ingredients that I need to purchase if I don't have them already on hand (I also will sometimes write down where to purchase the item if I know it is on sale at a certain place). I will usually re-copy my list to a separate sheet (free download coming soon), or sometimes if I'm in a hurry, will take the whole sheet to the store(s). Sometimes it's helpful to see the menu while I'm shopping for whatever reason (if I end up purchasing an extra side dish or remember that I don't have an ingredient because I forgot to check, etc). 4. Weekly Menu Plan Sheet - my planning page (above) gets pretty messy with all the writing and changes I make while I'm planning. I like to re-copy it to this sheet (free download here) to have a nice, legible copy. I also take this out of my binder at the beginning of the week and hang it on the refrigerator for easy reference to know what to pull out of the freezer the night before, or so my hubby can see what's on the menu on any given day. 5. To-Try Recipes - I am always coming across new recipes I would like to try. Whether it be on the internet, in a magazine or from a friend, I keep a section in the binder for recipes. 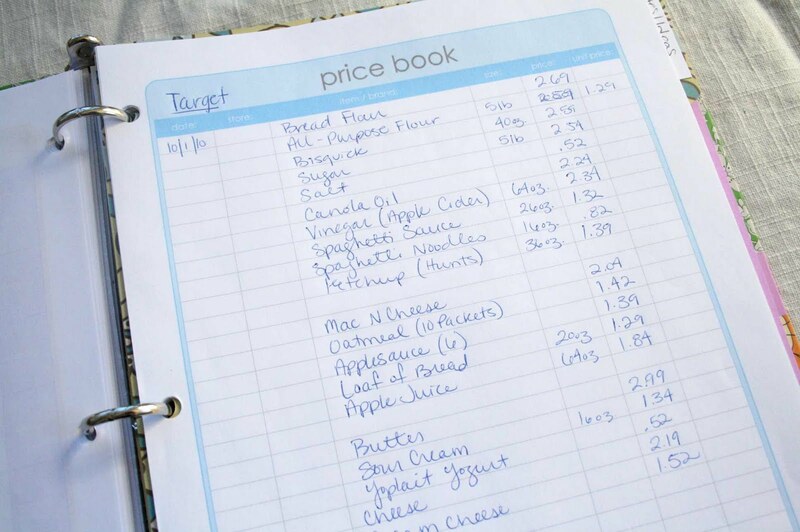 This way, when I am ready to try the recipe, the ingredients are all right there to incorporate into my list and I know exactly where the recipe is (in my binder!) when it is scheduled :) I know for me, I used to print or jot down recipes and then they would end up disappearing. 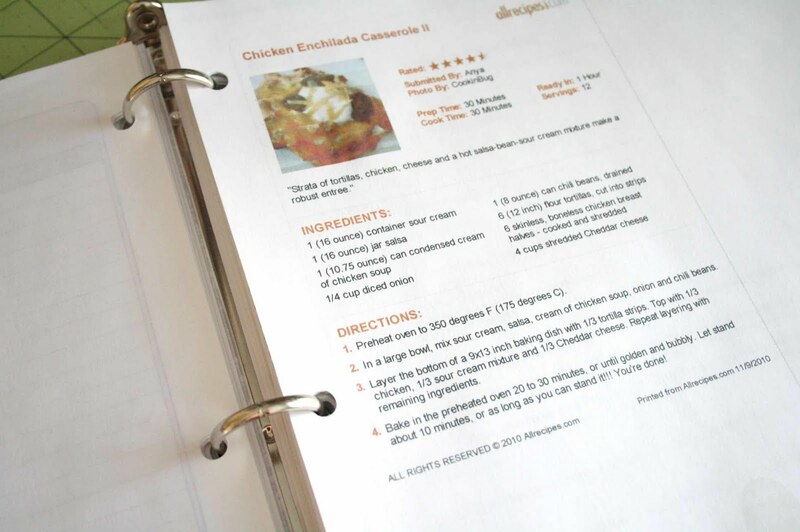 It's great to print off a recipe, punch it with the 3-hole punch and pop it in the binder (I keep a 3-hole punch right by my computer). 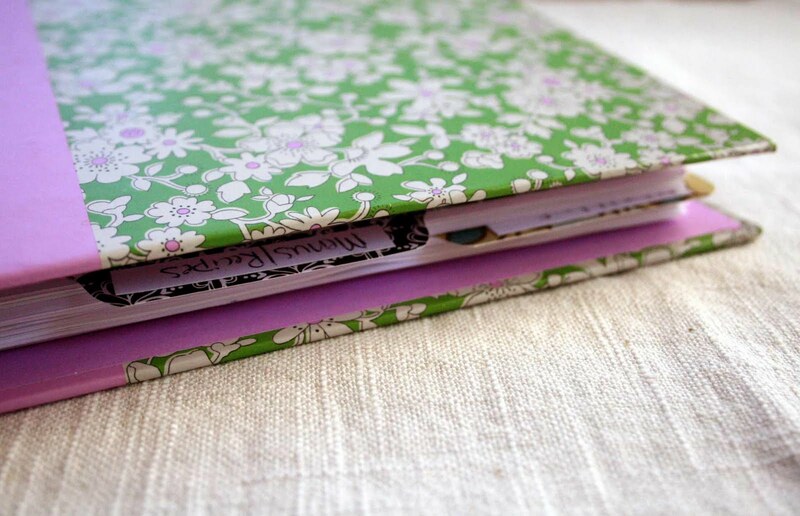 I also keep blank sheets in this section to write down recipes or to paste in ones from a magazine. Labels: Menus. Groceries. Budget. Ideas. Oooh, do you sell these? If not, you should. ;) It just might be on my Christmas list. Emily, I was coming to say the exact.same.thing. I NEED one of these, and I want it to be super cute in the way only you can make it, Ashley!!!! Pretty, pretty please! thanks for posting this - i've been trying to get my mind (and schedule!) around meal planning without much luck. this should help out a lot! Thank you for the tips. I am a computer girl and have recently (inspired by you I might add) have set up a 5 week rotating meal plan in spreadsheet form not to mention 2 other spreadsheets one for shopping and one for budgeting. I am looking forward to future inspiration. Wow! This is helpful. THank you for posting - I can't wait to see more =) Cheers!